For years, it was hard to come across Hear the Wind Sing and Pinball 1973, Haruki Murakami’s first and second novels, unless one wanted to pony up something between $250 and $400 at Amazon for their Kodansha English editions. The author has long dismissed them as juvenilia, though he was far from a juvenile at that time, and was actually managing a jazz bar on the outskirts of Tokyo with his wife and writing his first works at their kitchen table. He was searching for a style as a novelist, and it was once he wrote A Wild Sheep Chase that Murakami became the writer he envisioned. On August 4, Knopf will publish both novels in a single volume with new translations by Ted Goossen, so readers can make up their own minds on whether Murakami is being too hard on himself. A lot of the familiar Murakami elements and themes are there: a nameless narrator who likes his beer and smokes, cats, music, literature, spaghetti, mysterious appearances and disappearances, loneliness, and his poetic observations of nature. I can still recall the exact sensation. It felt as if something had come fluttering down from the sky, and I had caught it cleanly in my hands. I had no idea why it had chanced to fall into my grasp. I didn’t know then, and I don’t know now. Whatever the reason, it had taken place. It was like a revelation. Or maybe epiphany is the closest word. All I can say is that my life was drastically and permanently altered in that instant—when Dave Hilton belted that beautiful, ringing double at Jingu Stadium. After the game (Yakult won as I recall), I took the train to Shinjuku and bought a sheaf of writing paper and a fountain pen. Word processors and computers weren’t around back then, which meant we had to write everything by hand, one character at a time. The sensation of writing felt very fresh. I remember how thrilled I was. It had been such a long time since I had put fountain pen to paper. Each night after that, when I got home late from work, I sat at my kitchen table and wrote. Those few hours before dawn were practically the only time I had free. Over the six or so months that followed I wrote Hear the Wind Sing. I wrapped up the first draft right around the time the baseball season ended. 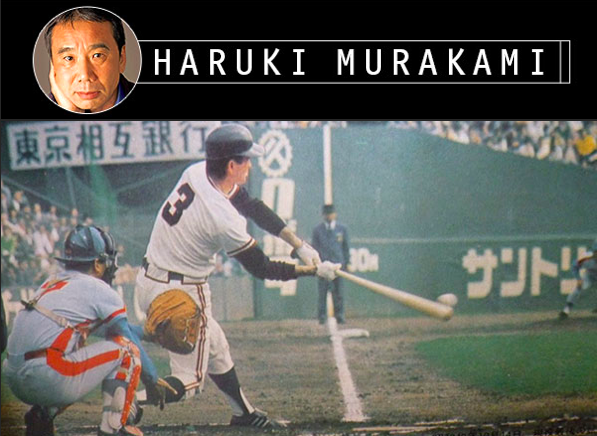 Incidentally, that year the Yakult Swallows bucked the odds and almost everyone’s predictions to win the Central League pennant, then went on to defeat the Pacific League champions, the pitching-rich Hankyu Braves in the Japan Series. It was truly a miraculous season that sent the hearts of all Yakult fans soaring. You can read the rest of Murakami's introduction over at Lithub. And pre-order the new translation of Wind/Pinball here.